Our ZirTek™ line of zirconia offers a strong solution for all your restorative needs and is available exclusively from Dental Masters Laboratory. The ZirTek™ line of products focuses on durability and esthetics; there is a ZirTek™ product for every indication imaginable. ZirTek™ Value is a posterior restorative option designed to match the VITA® Classical Shade Guide, which offers precise fit, form, and function. Additionally, ZirTek™ Value requires no technician staining. With a flexural strength of 1100 MPa, this restoration is ideal for posterior single crowns and posterior bridges of any size. Along with the rest of our ZirTek™ line of restorations, ZirTek™ Value has a lab turnaround time of 5 days and comes with a 7-year warranty. Full-contour zirconia is so versatile, it can be used in almost any situation from singles, bridges with any combination of abutments and pontics, inlay bridges, Maryland type bridges and screw-retained implants. Also an esthetic alternative to a PFM with metal occlusion due to limited space. When esthetic expectations are high and it is important that the restorations match surrounding natural dentition or other existing restorations. If bonding is necessary to retain the restoration, bond strength is weaker and less predictable than other ceramics. Shoulder preparation not needed. A mild chamfer or a feather-edge margin is good. 1mm buccal, lingual, and occlusal reduction is ideal, but can go to .5mm in some areas when reduction is limited. Minimum occlusal reduction of 0.5 mm; 1 mm is ideal. Adjustments and polishing: Adjust full-contour zirconia crowns and bridges using water and air spray to keep the restoration cool and to avoid microfractures with a fine grit diamond. If using air only, use the lightest touch possible when making adjustments. A football-shaped bur is the most effective for occlusal and lingual surfaces (on anterior teeth); a tapered bur is the ideal choice for buccal and lingual surfaces. 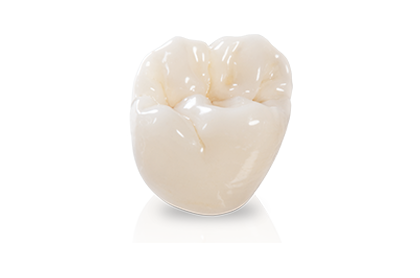 Polish full-contour zirconia restorations with the porcelain polishing system of your choice. Full-contour zirconia may be cemented using a resin reinforced glass ionomer such as RelyX Luting cement. When a greater bond is needed due to the lack of a retentive preparation, use resin cement like RelyX Unicam or RelyX Ultimate. Before cementing all full-contour zirconia crowns, the interior surface of the crown needs to be cleaned with Ivoclean (Ivoclar Vivadent - Amherst, NY). This is critical in assuring maximum bond strength. Solid zirconia requires a cast gold type preparation. If adjustments are needed, use zirconia specific diamonds and rubber wheels polishing with diamond paste.